Join us on this fantastic two-day tour that is the absolute best way to explore two jewels of Iceland’s remote Highlands: Landmannalaugar and Thorsmork. 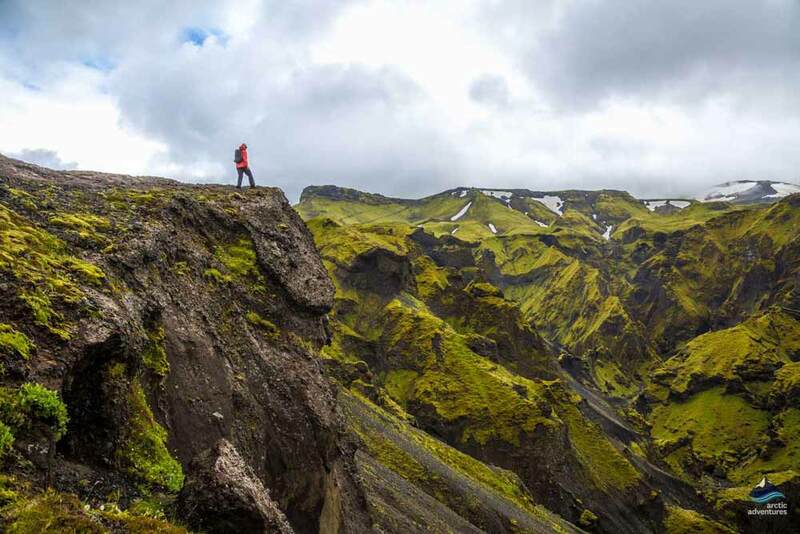 As the start and end points, respectively, of the world-famous Laugavegur Trek, these two regions are the ultimate hiker’s paradise. Instead of trekking from one end to the other – which would take at least four days and require overnights in tents or mountain huts – we’ll embark go on a spectacular one-day hike at each end. This will allow us to stay overnight in a lovely, comfortable country hotel. 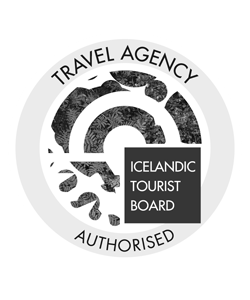 Join this extraordinary tour and experience the very best hiking spots Iceland has to offer without having to rough it! 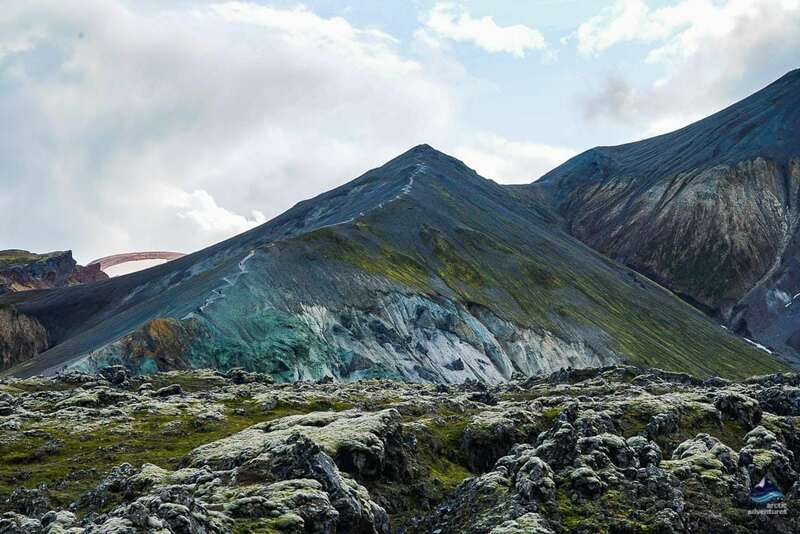 Both Landmannalaugar and Thorsmork are located in the southern part of the Icelandic Highlands, some 55 km (34 mi) apart. Though both are popular among hikers and adventurers, they look nothing alike. 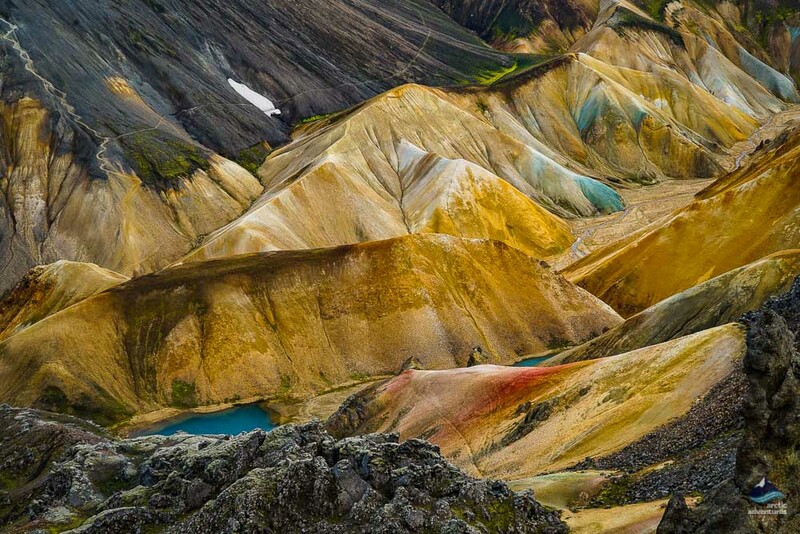 Landmannalaugar is a colorful geothermal area, a smoky valley surrounded by rounded rhyolite mountains. In the middle of the valley, an obsidian lava field stretches out over several kilometers. The nearby mountains are painted in a kaleidoscope of colors: red, blue, yellow, green, purple, white, and black patches that cast the landscape in a surrealistic lens. To top off the otherworldly quality, steam rises from the ground here and there. 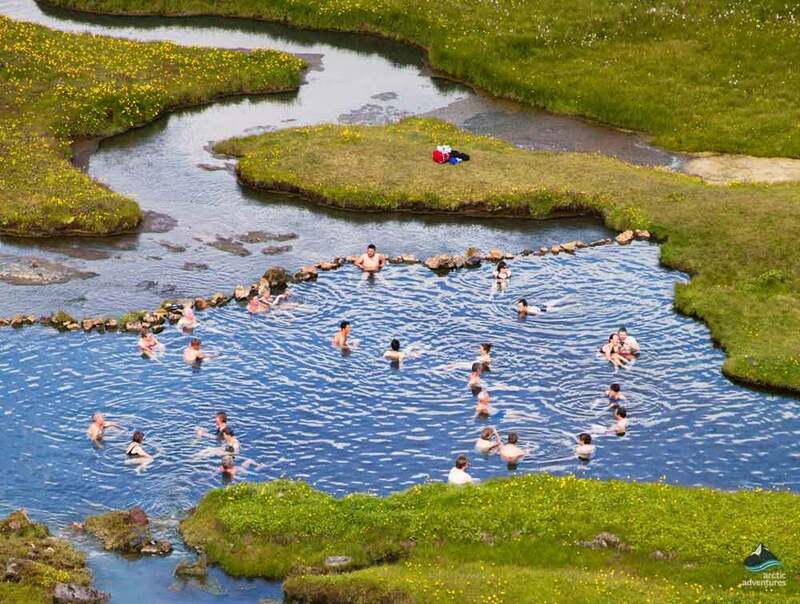 There’s even one natural hot spring where you can take a dip. Thorsmork, on the other hand, is a whole different world. This vibrant green valley lies nestled in between three glaciers, surrounded by sharp, moss-covered mountain ridges. 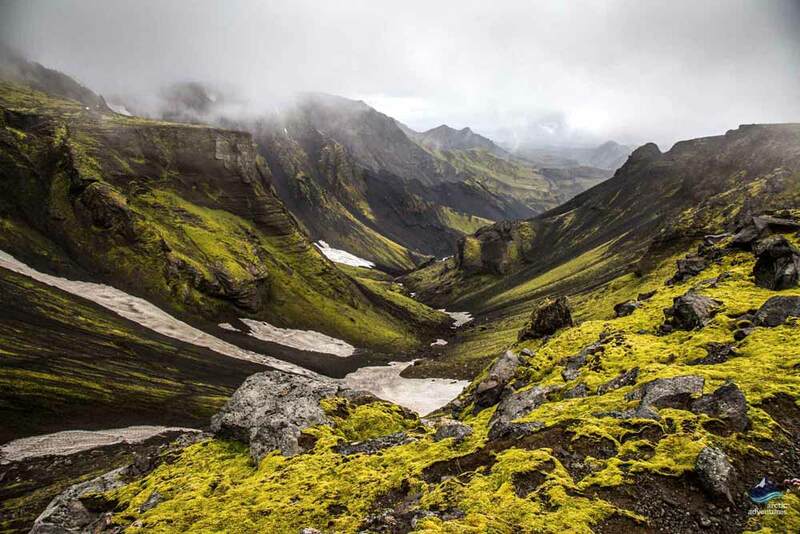 While Landmannalaugar has hardly any vegetation, Thorsmork is rich in rare Arctic flowers, birch forests, and various mosses, which together provide an ideal habitat for many bird species and adorable Arctic foxes. This 2-day tour is made up of two separate one-day hikes. 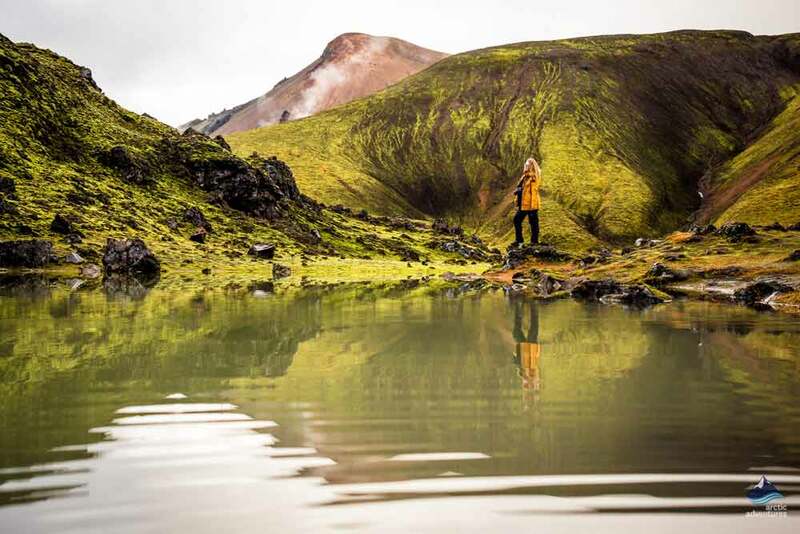 On the first day, we’ll pick you up in Reykjavík and drive over the Highlands to Thorsmork, crossing several streams and rivers along the way. After leaving our Superjeep behind in the valley, we will hike up to the Fimmvörðuháls mountain pass between two glaciers. 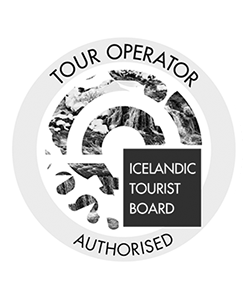 We’ll reach the volcanic craters that were formed during the Eyjafjallajökull eruption of 2010. After summiting the peak, we’ll descend back on the same route. In the evening, we’ll leave the Highlands to spend the night in a small country hotel in South Iceland. The next day, we’ll take a different Highland road and drive to Landmannalaugar. Once there, we will have the chance to hike one of the numerous loop trails and bathe in the hot spring. After the long and adventurous day in the wilderness, we’ll drive back to Reykjavík and drop you off near your accommodation. Pickup will begin at 8 a.m. in Reykjavík. 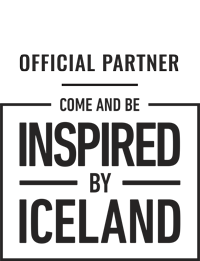 A specially designated Highland bus will pick you up at your previously selected location before heading south. After a scenic drive along the South Coast, we will leave civilization behind and turn inland towards the Thórsmörk Valley in the Highlands. Before we do, we’ll take a quick detour to the majestic Seljalandsfoss waterfall, that famous cascade that you can walk behind. The drive through the Highlands will be quite adventurous, as we’ll have to drive on gravel roads and cross several streams and rivers along the way. The landscape will be entirely different from what we saw the day before. We’ll pass by glacier tongues and jagged mountain ridges. After all these bizarre formations, you’ll come to understand why trolls have played a huge role in Icelandic folklore. We’ll stop in the very heart of Thórsmörk, where we’ll leave the Super Jeep behind as our feet take over. We’ll start our ascent slowly, and once the trail turns steep, be sure to look around. The landscape will blow your mind! We’ll continue the climb until we reach a wide plateau for a spectacular view of the Highlands and the surrounding mountains. 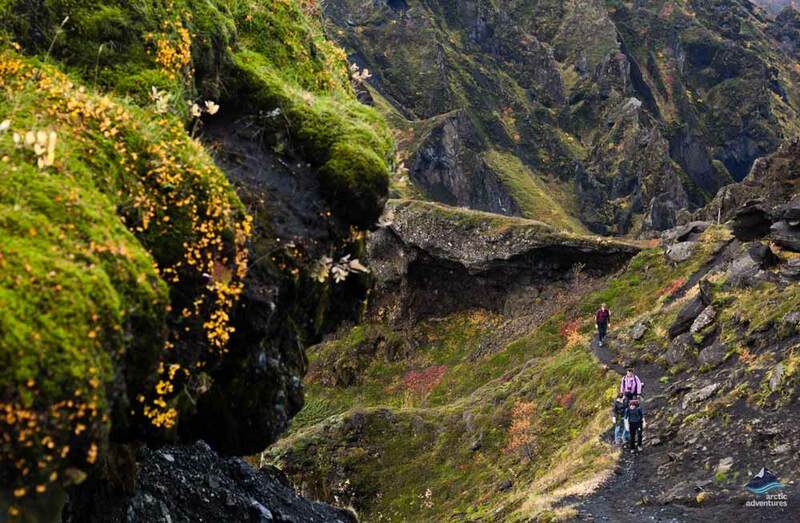 From here, the trail starts to ascend steeply again to reach the Fimmvörðuháls Mountain Pass. 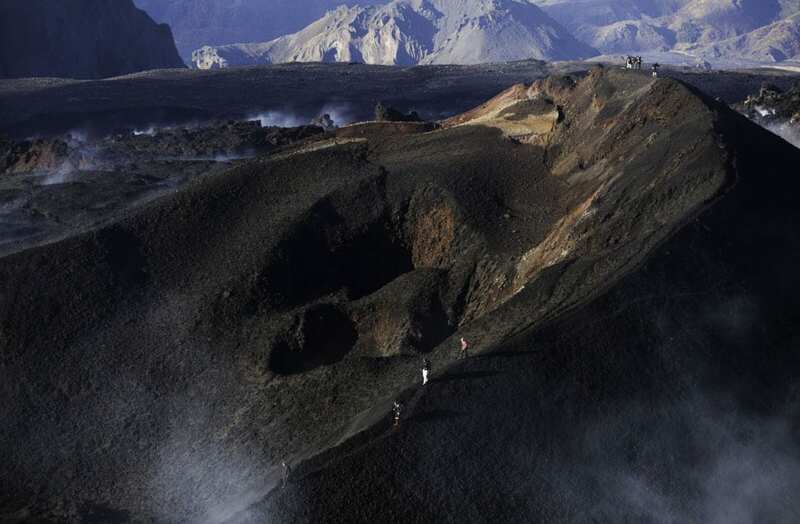 We’ll stop by the two volcanic craters, Magni and Modi, formed in the infamous Eyjafjallajökull eruption of 2010. The fresh lava rock, the large craters, and the glaciers in a backdrop of the mountains’ vibrant colors all make this hike truly outstanding. In good weather, we’ll be able to see the Landmannalaugar Mountains. This is a demanding, but certainly rewarding, hike. The elevation gained is approximately 800 meters (2,624 feet) with a total length of 16 km (9.9 mi ). 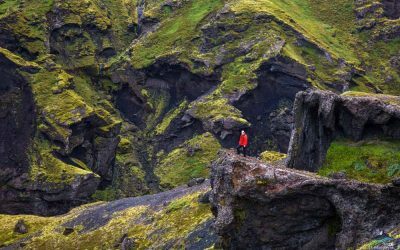 Many Icelanders and visitors alike agree that Thórsmörk offers some of the most enchanting landscapes in all of Iceland. After summiting the peak, we’ll descend back on the same route, now facing the valley and its breathtaking views. 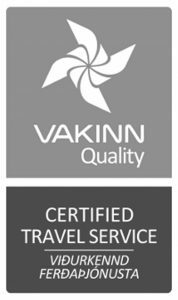 After the long and adventurous day in the wilderness, we’ll drive back to Reykjavík and drop you off near your accommodation. 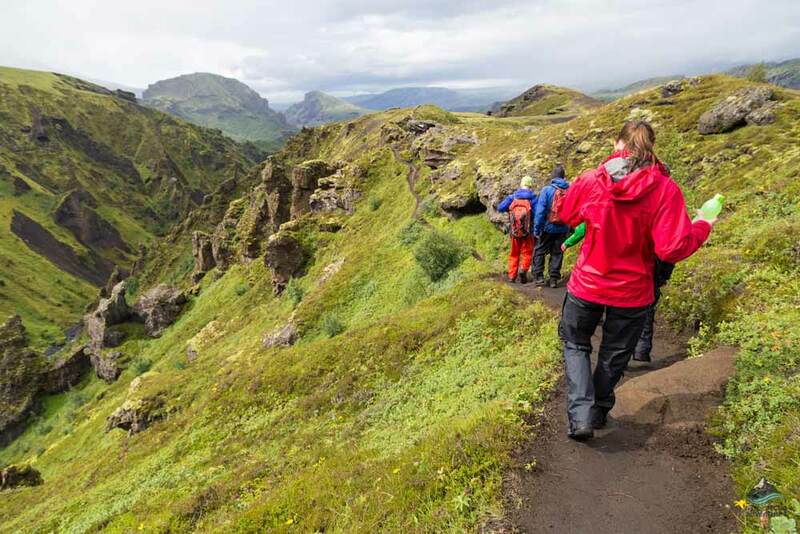 The Thórsmörk–Fimmvorduhals Hike shouldn’t be missed by any outdoor enthusiasts visiting Iceland! After the hike, we’ll return to our super jeep and drive back to the South Coast. We’ll spend the night in a charming hotel in Hella. The next day, after a delicious breakfast, we’ll jump in our bus and take another Highland route to Landmannalaugar. Before we do, we’ll take a quick detour to the majestic Seljalandsfoss waterfall, that famous cascade that you can walk behind. From here, the journey will get a little bit bumpier and the landscape will become more surreal as we go. 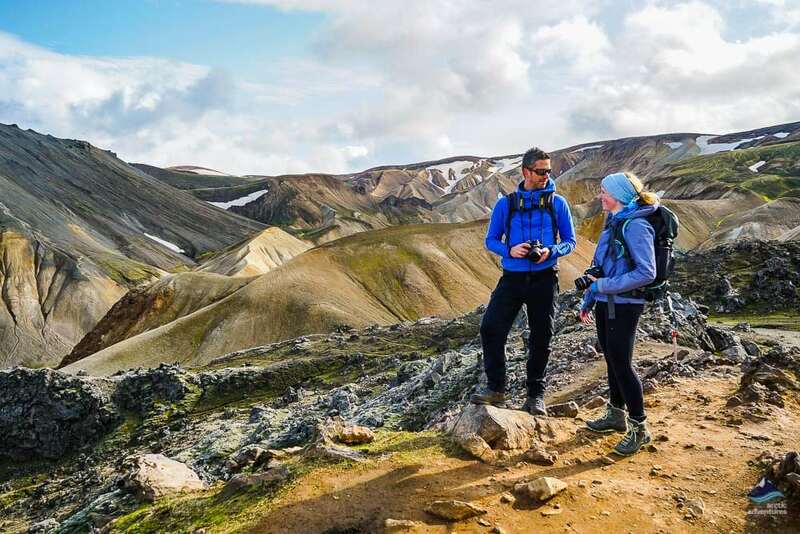 We’ll drive through black rocky deserts, moon-like landscapes and pass by the active volcano Hekla until we finally arrive at our destination, the Landmannalaugar basecamp. 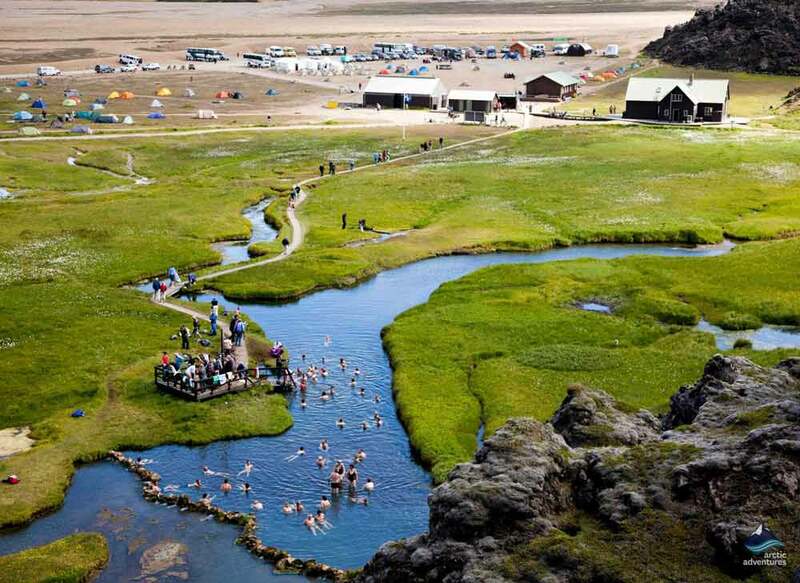 This camp is situated in a colorful, geothermal valley between the mountains. Here we can catch a quick rest, toilet break and a bite at the campsite. The hiking trails start right at the huts. The most scenic hike takes us across the valley, through the Laugahraun lava field where we can observe the obsidian fields. 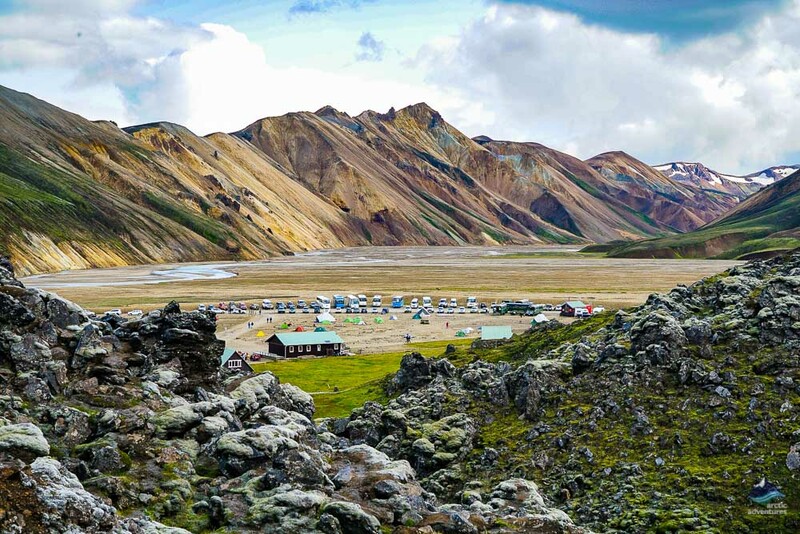 We’ll be surrounded by all the colorful mountains for which Landmannalaugar is so famous. 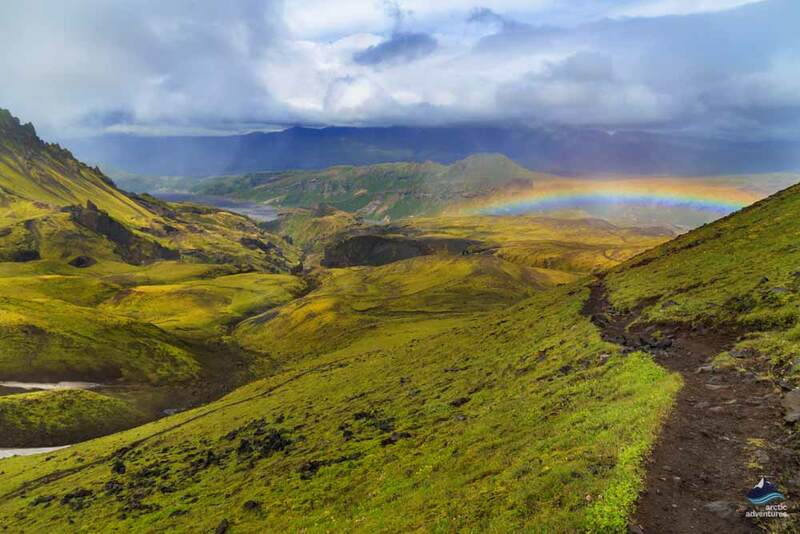 We will walk the first few kilometers of the world-famous Laugavegur Trail all the way up to Mount Brennisteinsalda where the trails split. We’ll continue our loop hike through an incredibly green canyon called Graenagil. 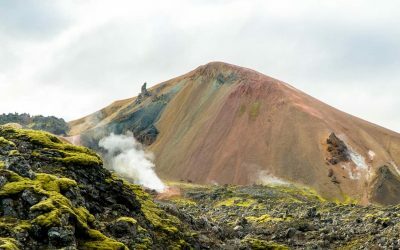 If time permits, we’ll climb up to the summit of the spectacular Bláhnjúkur volcano (the Blue Peak) before arriving back at the base camp and jumping in for a long soak in the Landmannalaugar hot pool. This hike is around 10 kilometers (6.2 miles) long and takes approximately, 4-6 hours, with a maximum ascent of 503 meters / 1650 feet.